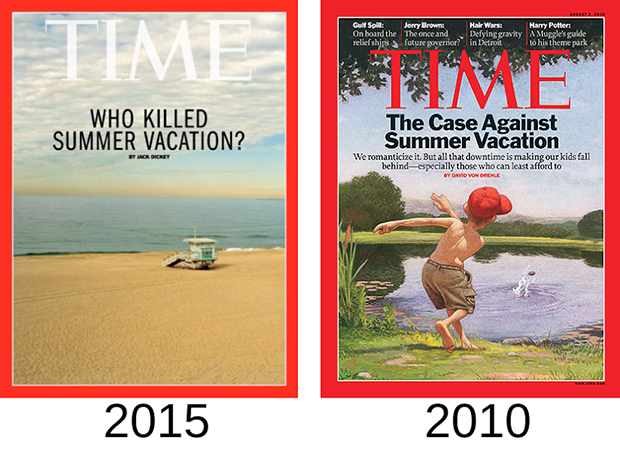 The article five-year-old cover article was about children’s summer vacation and how it’s a legacy of the farming era. It proposed eliminating this tradition because lower-income children lack summer camps and programs to keep them sharp for the coming fall semester. This week’s article (still behind a paywall), argues that adults don’t take vacations and America ranks as taking the fewest vacation days. But in our job-squeezed benefits-lacking economy, who can afford a vacation? We all need time off.